When I was standing in front of Catrice products stand in Paloma, among all things prettily displayed - their cream eyeshadows caught my attention. This is because I have been hearing/ reading beauty gurus raved about Maybelline Color Tattoo and L'Oreal Infallible which sadly are not available here. 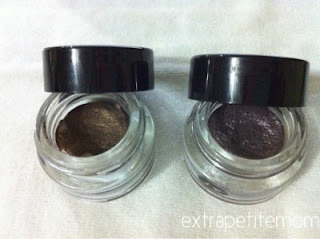 So these are, in my opinion, good alternative for me to try cream eyeshadows. I bought 040 Metall of Honor - a bronzy- brown colour with gold shimmer and 070 Mauvie Star - a greyish lilac with lots of multi-colour shimmers. After trying these cream eyeshadows, I prefer it more than powder eyeshadows. You know when you're in a rush (or lazy), you can just pat this on your lids, wear eyeliner then mascara (not in my case though) and you're done! The texture for these cream eyeshadows is however inconsistent; Metall of Honor is quite dry and Mauvie Star feels creamy and mousse-like. Lasting power, no doubt it can last all day without creasing (even without an eye primer) LOVE! 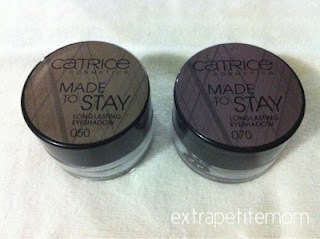 Although once I tap it on my lids, I need to blend quickly as it dries really fast! It does not smudge so its hard to blend once it sets on the lids. 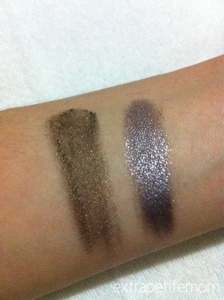 I have tried using eyeshadow brush and fingers and both works well making it wearable for day and night. Available from Paloma for B$5.90 each. I wish there are more usable colors. lol, not that I won't use the colors above, but I'd like to use for everyday's makeup. So they're the same like essence's? The texture. I own two but I rarely use them. The Maybelline Color Tattoos are gonna be released in June in Malaysia, that's what Sasa told me. But yeah, di Singapore ada udah. Texture wise, I prefer Essence although after having them all for a while now, I realised that they dry rather quick. I like to use Essence for work just because I have them in lighter colour.